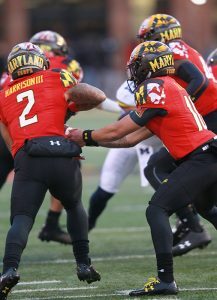 The Maryland Terps entered the game today against Michigan searching for answers with an offense that has been struggling to find ways to put points on the board, today they started the walk-on quarterback Ryan Brand and the results were about the same in previous weeks. Maryland struggled offensively in the first half and failed to get on the board in the first half, meanwhile Michigan found a way to hit on 28 points in the first half and keep the Terps defense on the field, wearing them down late in game. Brand did lead the Terps down the field in the third quarter with a right mix of run and pass plays. He connected with Ty Johnson for 28 yards, Taivon Jacobs for 26 yards, and D.J. Moore for 11 yards ultimately leading to a Henry Darmstadter 20 yard field goal. Maryland’s only touchdown came from a Ryan Brand-Taivon Jacobs 10 yard connection. Jacobs recorded eight receptions for 92 yards and that score. Until the Terps prove the have the ability to lead the team down the field in the first half, D.J Durkin is going to have a tough time convincing the Maryland faithful that this his plan is going to work to turn this team around anytime in the near future. Durkin tried a lot of fancy plays with reverses and passes back to Brand, but none of those plays netted the Terps any sizeable gain on offense. “I think we’re a team still trying to find ourselves,” Durkin said after his team’s fifth loss in its past six games. “No disrespect to him, Brand, he is a redshirt sophomore quarterback. We’re starting a fifth-string quarter back playing one of the best teams in the country. There was a little tentativeness. I said are we really going to do this, is this actually going to work, is it going to happen?